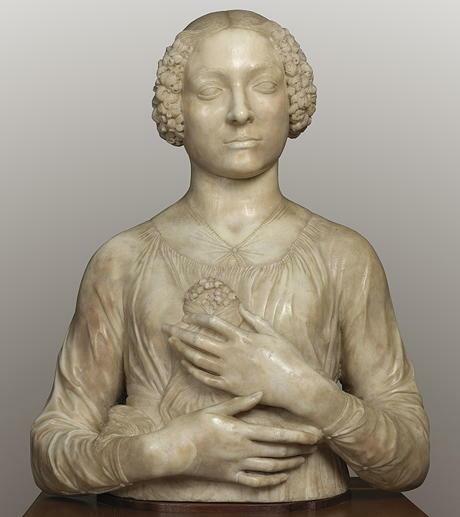 Andrea del Verrocchio, Lady with Flowers, ca 1475, marble, 59 x 46 x 24 cm. Florence, Museo Nazionale del Bargello, loan from Ministry of Fine Arts. FLORENCE – Leonardo is the talk of the town, as always, and even more so now with the 500th anniversary of his death. But who could name his master, the one who trained him during the 1470s? While the creator of Mona Lisa (1452-1519) was rather a solitary genius, Andrea del Verrocchio (circa 1435-1488) was on the contrary a sort of orchestra director at the head of a buzzing workshop that received all the most prestigious commissions in Florence. That is probably what most hurts his renown, since being the great master of ceremonies that he was, he too often delegated his commissions. He was very gifted in the disciplines such as jewelry or monumental sculpture seen in the tomb of the Medici, but these became minor in comparison to painting. He therefore left no identifiable pictorial works. On the other hand, his students’ hands replaced his. That is where Leonardo, but mainly Lorenzo di Credi, Ghirlandaio or Perugino step in! The single fact of having trained this remarkable generation should make of him a deus ex machina and this exhibition – surprisingly the first true retrospective dedicated to him – should help set things straight when bringing together his works and those of his disciples. Like all great heroes, Verrocchio died in a manner worthy of the greatest novels: according to Vasari, he passed away in June 1488 in Venice following an effort while casting the monument to Colleoni. His heir, Lorenzo di Credi, brought the body back to Florence, his native town. • Verrocchio, il maestro di Leonardo at Palazzo Strozzi, from 9 March to 14 July 2019. Jules Migonney, The Turkish Bath, 1911, oil on canvas, 104 x 188 cm. Bourg-en Bresse, musée du Monastère royal de Brou – © Carine Monfray, Photographer – collection of the Musée du Monastère royal de Brou. PARIS – The East can be considered Far or Middle, but it is always complicated! Maybe that is why it has always fascinated us? Marco Polo’s illusions of silks and opium gave way gradually to phantoms of harems, hookah, and the desert. The literary and pictorial East is right next to us, from the South of the Mediterranean all the way to Turkey, with Istanbul – better named Constantinople – as one of its major magnets. This exhibition follows the steps of real travelers such as Loti, Delacroix and Fromentin or travelers in their minds like Ingres, and in doing so takes stock of this love capable of resisting all the upheavals of geopolitics – independences or Islamist terrorism. Not all is rosy-posy in the visions the painters transmit to us. The cruelty of these regions bursts in le Pays de la soif (The country of thirst) by Fromentin or Delacroix’s The death of Sardanapalus. But the images of voluptuousness reign no matter what, in particular in the myth of the Turkish bath and its languorous naked women. The exhibition presents a varied choice, from the ever-present Ingres to the lesser known Debat-Ponsan or Migonney. And we can’t forget Vallotton, who makes them look like strange Parisians sitting by the pool. Vilhelm Hammershoi, Interior with a woman standing, not dated, oil on canvas, 67.5 x 54.3 cm, Ambassador John L. Loeb Jr. Danish Art Collection © TX0006154704, registered March 22, 2005. PARIS – As the title of the exhibition says, he was a master of Danish painting. As much as Balke or Eckersberg. But in a more definite manner, he was a master of silence. His work, modern and radical, but now largely forgotten, had left a strong impression during the retrospective in 1997 at the musée d’Orsay. It showed stripped interiors with a few pieces of furniture that reappear from one composition to the next (his own apartment actually), few characters (generally his own wife, seen from the back). This new presentation of Hammershoi (1864-1916) also enhances lesser-known aspects of his painting, such as landscapes, both urban and rural – and a few severe nudes. • Hammershoi, le maître de la peinture danoise, at the musée Jacquemart-André, from 14 March to 22 July 2019. TOULOUSE – He never set foot back in Spain after 1934. His request for French naturalization was refused in 1940, so Picasso remained a Spaniard all his life. Though he never experienced the hardship of the refugees locked up in the camps of Gurs or Argelès, and instead lived comfortably from his art, Picasso always sympathized with the situation of his compatriots in exile (among them people from his own family, like his nephews Vilató). The exhibition shows how the theme was permanently in his work, and his relationship to his native country (with important Meninas lent by Barcelona). But it also establishes a link with other Spanish artists who were confronted with la Retirada, and presents an impressive quantity of documents. • Picasso et l’exil, at the Abattoirs, from 15 March to 25 August 2019. His name was rather common, but his career was definitely not: Jean Fournier was one of the most influential gallery owner sin Paris during the second half of the XXth century. This biography, which is the first of a series commissioned by the Comité professionnel des galeries d’art, describes with many details his professional life, that took him from being a bibliophile (a passion he never lost, which can explain the almost manic care he gave to invitations), to defending the most contemporary art, in a manner just as resolute as his alter ego Claude Bernard, with a few emblematic artists such as Simon Hantaï, Claude Viallat or the American in Paris, Shirley Jaffe. He was the son of shop keepers from the Nièvre, then a butcher apprentice in the Halles, his world changed when he walked into the bookstore Galignani and then into the library-gallery Kléber. It was in the latter that he signed his first exhibition in 1954, at the age of 32, with Joseph Sima, who introduced him to Colette’s daughter. Until his demise in 2006, over more than half a century, he led an active life between his galleries on rue du Bac and rue Quincampoix, with Degottex, Sam Francis, Buraglio or Joan Mitchell, who was till so little known in the 80s that he referred to her as a “young artist”. • Jean Fournier, un galeriste amoureux de la couleur, by Catherine Francblin, Hermann publishing house, 2018, 148 p., €23.